Let's Break Some Card Frames! I want you to do stuff like this. I'd provide more examples I've thought up (and maybe at the end of the contest I'll go over the card concepts I had that didn't end up coming up) Now, I know MTGCS is limited to only certain card frames, so if you want to make a card that can't be visually pulled off in MTGCS, you are free to submit text-only cards of your concepts and I can see if I can make them work using Magic Set Editor. 1. Your card can be done through any editor (MTGCS, MSE, etc.) or done in text (or drawing, or any other method that conveys your idea). 2. Editing your entry is allowed up until I call for judging. 4. Old entries are totally allowed if they meet the judging criteria (seen below). 6. Unset cards are allowed when used to get away with unique effects that couldn't normally be done in the game. I don't exactly want cards made to be funny, I want the card to scream: "Hey! I can't normally do something like this in black-bordered games!" (Think Augment form Unstable.) 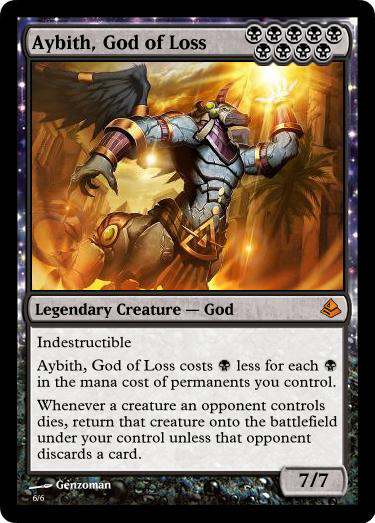 Just let me know the design is intended for an unset. I'm going to score out of 100 for easy comparison. 35pt: How well designed the card(s) are. 30pt: Creativity and originality of the card(s) and concepts used. 10pt: Interaction of the card(s) with themselves and other official cards. 7pt: Flavor of the card(s) (Which doesn't necessarily have to include flavor text). 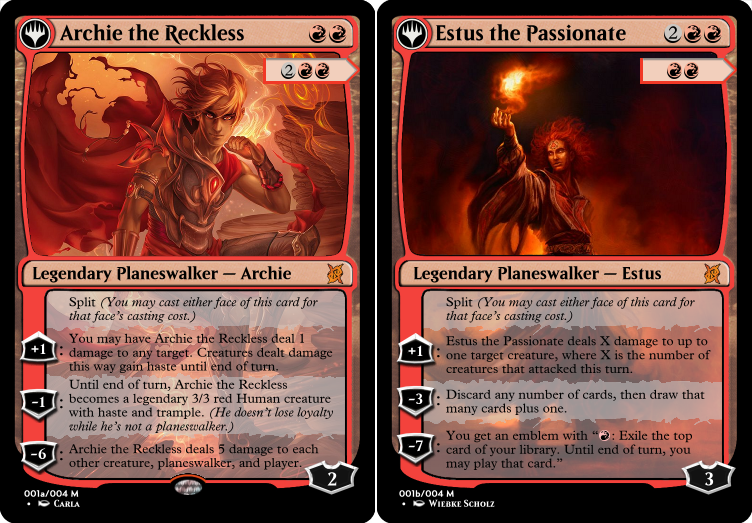 I'd recommend using the following template, but as long as I can understand the card layout and such, any formatting is fine. 3rd: A fave on your card (if it's made through MTGCS) and I'll look through your cards and fave 2 cards I like. 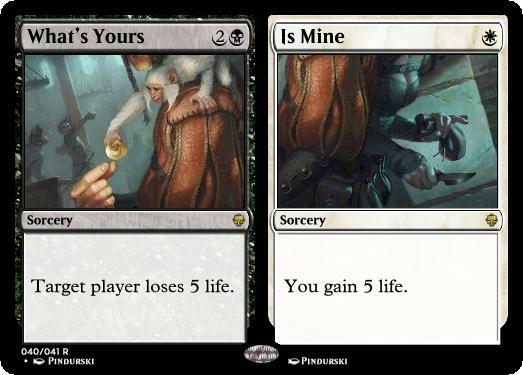 2nd: A follow, a fave on your card (if it's made through MTGCS) and I'll look through your cards and fave 4 cards I like. 1st: A follow, a fave on your card (if it's made through MTGCS), and I'll look through your cards and fave every card I like. I will fav at least 6 cards when doing this. The tentative deadline for this contest is 10/1/18 (Updated! ), but that could lengthen if enough people request it. Enough entries can also justify me upping prize stakes and adding more winning placements. Feel free to send me any other questions, comments, and/or concerns and I'll try to get back to you. Happy smithing! May you write some more examples of what you're looking for in the comments? I'm having art block and would like more information on the broad type of unique uses you want seen. Currently, I'm thinking of having a planeswalker that transforms into a creature. That certainly counts, the term for that is "Sacrificer" to my knowledge. I'll post some examples of official cards that did a first-time thing in just a minute. So, yeah, do things like this, innovative concepts that push the boundaries of what a card type or card frame can do. I can’t describe it. Is there a way a can draw a thing? Sure! Basically, as long as I can tell what the heck you're trying to do, any method is fine. 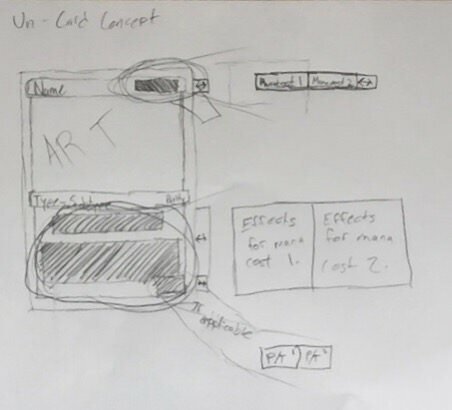 You could either draw it IRL and take a picture of it, then upload it to imgur and use html to add it to the forums or do the same thing digitally. Hahahaha! That’s just amazing! I love it! Would you mind providing some more specific examples? Like what effects they could have? Gain 5 life. // Target player loses 5 life. I think I get the concept, with the right card sliding on top of the left card sliding on top of the right card, right? @ninyounk, that’s not what I meant. I know what a split card is and it wasn’t! I don't get it, hence why I'm asking x) Arceus was mentioning cards you slide one onto another? If you look at my “lovely illustration,” you will see tabs on the sides of the cards. Then the circled bits are being enlarged and showing what’s there. The two things being the two possibilities. 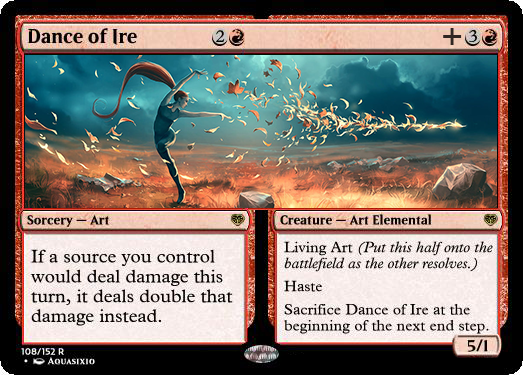 It's based on an idea from TheProxyGuy for Aftermath cards. So I know it’s well past the deadline, but I’d like to see some more entries to this. My new tentative deadline is 10/1/18.